For testing purposes, it is useful to be able to get rid of the cookie (without waiting for a week for it to expire.) To save you the trouble of figuring out how to do thisit varies depending on the browser and operating system you are usingwe have provided a Web page,Cinema.RemoveCookie.cls, to do it for you. In case you are wondering, a cookie is removed by setting its expiration date to a date in the past. See the OnPage method in Cinema.RemoveCookie for an example of the necessary code. 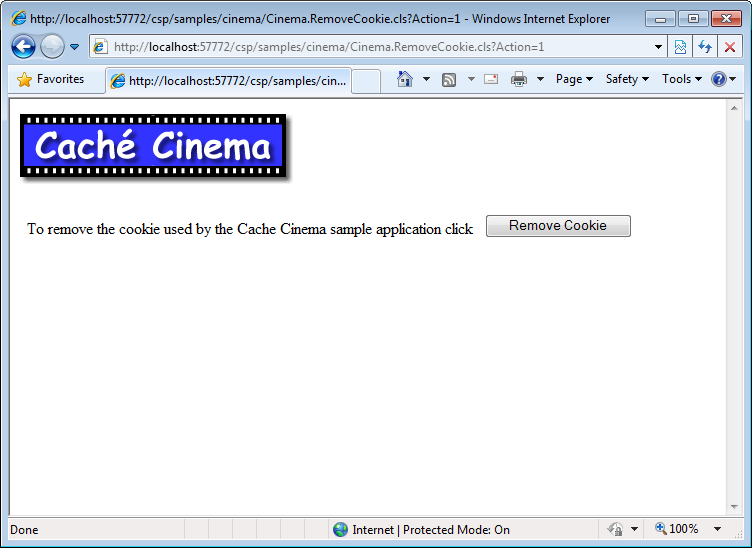 You can find Cinema.RemoveCookie in the SAMPLES namespace.